It is said that Magna Carta, an agreement which is more than 800 years old, helped lay the foundation for our modern freedoms and liberal democracy. The tour ‘bus pulls up with a hiss of brakes next to a nondescript, but pleasant, meadow alongside the Thames in Surrey. “This is where the barons forced wicked King John to agree to Magna Carta,” announced the guide. Despite that old schoolboy joke, many people (including former Prime Minister David Cameron when interviewed on US television in 2012) do not know what Magna Carta means (it means Great Charter). Nor do many of us fully understand what it was, or its significance. Magna Carta was an attempt to limit the authority of the medieval monarch, transferring some of the Crown’s power to the barons. It was agreed at Runnymede (the meadow at the island where councils are held) on 15th June 1215, King John put his seal to it on 19th June, it was revised three times during the reign of his son, Henry III and confirmed by his grandson, Edward I, in 1297. Some people grant Magna Carta a semi-mystical status far beyond the wildest dreams of its authors. Most of its provisions dealt with contemporary grievances and issues, such as fish-traps on the Thames and the treatment of Welsh prisoners. One thing’s for sure: no medieval peasant opened his morning paper on 16th June and whooped with joy at the news of newly-won liberty and security under the law. Yet, 800 years later Magna Carta was celebrated all over the western world and a ceremony to mark the centenary was held at Runnymede, attended by Her Majesty Queen Elizabeth II, other members of the Royal Family, representatives of HM Government and foreign dignitaries. 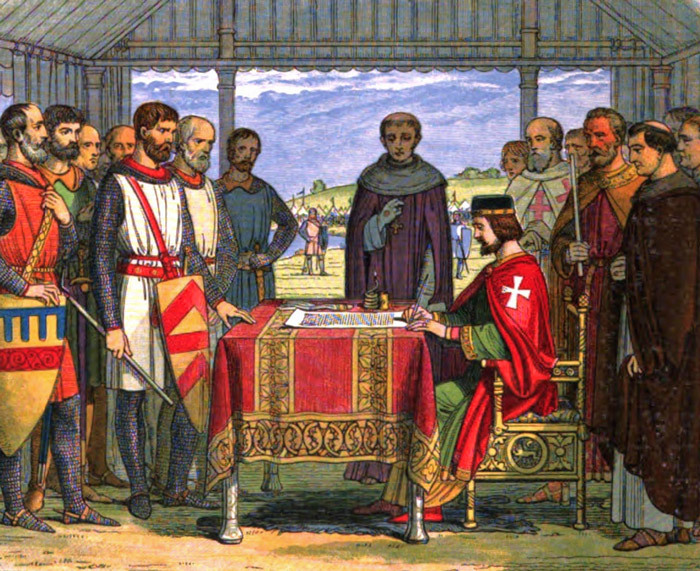 On this occasion, David Cameron, far from not knowing what it meant, claimed that Magna Carta had changed the world. So why all the fuss? 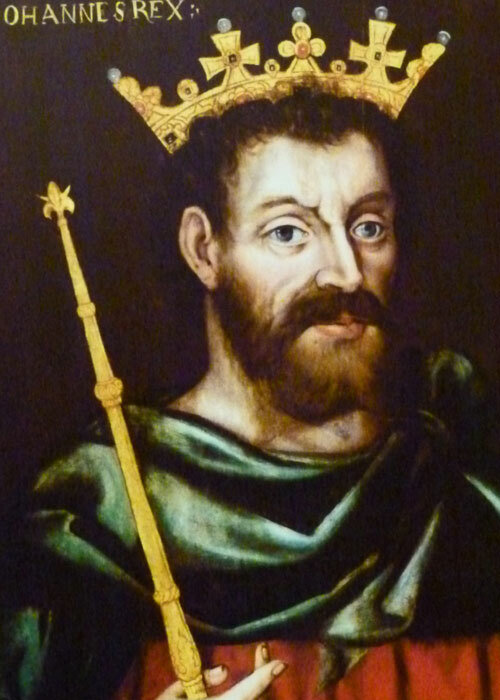 King John doesn’t top too many polls of popular monarchs. He is usually portrayed as scheming, overtaxing and incompetent; a cruel, untrustworthy, tyrant, prone to uncontrollable tantrums, who played fast and loose with other men’s wives (and daughters) and was, to cap it all, anti-church. In fairness, many of the complaints against the monarchy pre-dated John’s reign. History is often written by winners and it is possible that some of the bad publicity came from John’s enemies; but most historians agree that he was a thoroughly nasty bloke, even by the standards of the time. Nicknamed Lackland by his father, Henry II (because he had no land to give his youngest, fifth, son), John treacherously tried to seize the throne from his brother, Richard I (the Lionheart) and has been blamed for the brutal murder of Arthur of Brittany, his nephew and rival for the throne. He inherited lands that stretched from the Pyrenees to the Scottish border, but spectacularly managed to lose most of those in what we know as western France, with the notable exception of Gascony. He had a dramatic falling-out with the Pope, Innocent III, over the appointment of the Archbishop of Canterbury, which resulted in a papal interdict, suspending all church services in England. John seized church revenues and lands and was subsequently excommunicated. Eventually, concerned about the threat of French invasion and his own plans to re-take Normandy, John gave in. He accepted the appointment of the Pope’s nominee, Stephen Langton, as Archbishop of Canterbury and, in a clever twist, made England a fief of the papacy – obliging the Pope to protect it. Meanwhile, John had campaigned successfully and expensively in Wales and Scotland. But his wars in France, funded by church revenues and heavy taxation – including scutage (a payment barons owed the king in lieu of military service) – ended in failure. On 27th July 1214, John’s northern allies were decisively beaten by the French at the Battle of Bouvines in Flanders. Back in England, the barons were seriously hacked off. When attempts to discuss their grievances failed, they rebelled. In May 1215, they captured the Tower of London and, as the historian David Starkey coyly remarked, “Had King John by the privates.” The King was forced to negotiate and, on 10th June the two sides met at Runnymede, neutral territory between London and the royal fortress at Windsor. 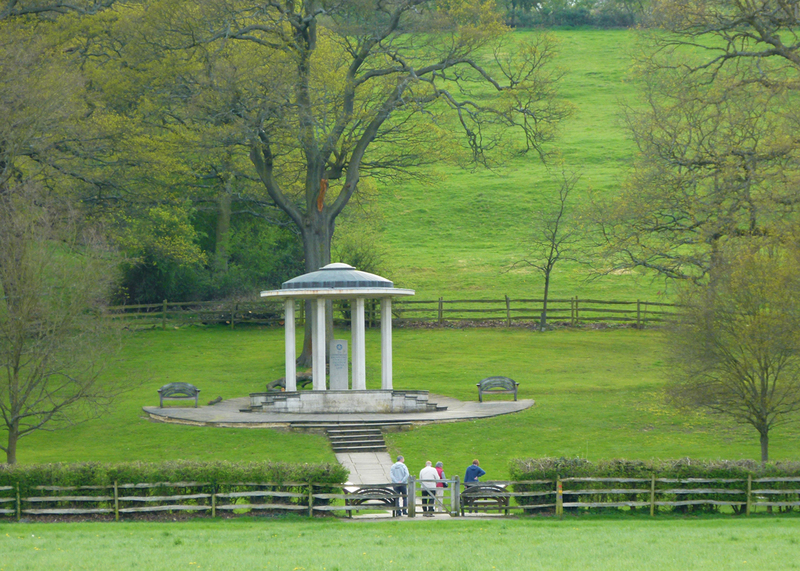 Runnymede was possibly a traditional meeting place, though some versions of the history claim the talks took place in a waterlogged meadow and others on Magna Carta Island in the river itself; both were ideal, since neither was suitable for any armed struggle. Incidentally, if you’ve some spare change, the island was on the market in 2014 for a mere £3.95 million. This is pretty noble and uncompromising stuff – it is one of three clauses that remain part of English Law and, really, the one that everyone gets most excited about. In 1215, of course, there were not that many free men (or women) in England. But this clause unequivocally says that the law is not subject to the whim of one person and that all of us are equal and accountable under it. The charter also includes an early version of ‘no taxation without representation’ and establishes a principle that certain rights could be settled by a council of 25 barons – though it did not establish taxation by consent, or a parliament. John, claiming that he only agreed to Magna Carta under duress (which is true), promptly asked his new chum, the Pope, to annul it. Innocent not only did so, but also roundly condemned it on behalf of Almighty God (etc) and claimed the charter was illegal and unjust. However, Pandora’s Box had been opened; rather like a hasty election pledge, too many people knew about Magna Carta to forget about it. One consequence of John’s reaction, though, was that the barons invited Louis of France to invade England – which he happily did in May 1216. John became a fugitive, famously losing the Crown Jewels in the Wash, in East Anglia (prompting another schoolboy joke: “Well, then he should change his laundry.”). Shortly after this, the beleaguered king died of dysentery (or from eating too many peaches) in Newark Castle. It is the legacy of Magna Carta that we celebrate. It informed much of what came later, including the Bill of Rights of 1689, the Constitution of the United States of America and the Universal Declaration of Human Rights in 1948. Settlers from these islands drew upon their roots, including the right to justice and a fair trial. Many see parallels between Magna Carta and America’s Declaration of Independence in July 1776 – resistance against a high taxing tyrant. Starkey notes that the Great Charter has been cited 400 times in the US Supreme Court since 1790, including when it decreed that prisoners in Guantanamo Bay should be freed. A copy of the 1297 version sits next to the Declaration of Independence and the US Constitution in the National Archives in Washington DC. A further copy of the 1297 version resides in Australia’s Parliament House in Canberra. Of the 13 copies of the original 1215 version, four survive: two are normally held in the British Library and the others in the cathedrals of Lincoln and Salisbury. Back to Runnymede: blink, and you’ll miss it. Oddly enough, there was nothing to mark the event on the spot until 1957, when a grand memorial commissioned by the American Bar Association (nothing to do with beer) was built. It is in the custody of the Magna Carta Trust under the chairmanship of the Master of the Rolls, the head of civil justice in England and Wales. 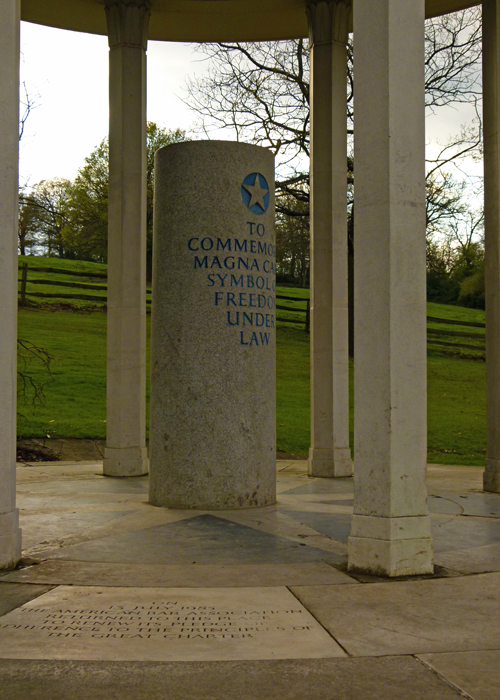 The memorial is inscribed “To commemorate Magna Carta, symbol of freedom under the law” and it is surrounded by English oak trees. I wonder whether it should look more medieval; but it’s very impressive and, let’s face it, we Brits hadn’t bothered at all. Unveiled on 15th June 2015 by Prince William is a new memorial, a sculpture by Hew Locke called The Jurors, consisting of 12 bronze chairs, each with a story to tell, around an invisible table. Runnymede is just off the M25, on a straight stretch of the A308 between Egham and Old Windsor. Or you could hire a boat. The scenery is agreeable, with abundant wildflowers, posh pads, but only the vague ghosts of medieval nobility. Stop and thank King John and his barons for their unwitting contribution to the 21st century and, if applicable, your freedom and right to vote; take a picnic. Nearby are Britain’s memorial to John F Kennedy and the Runnymede Air Forces Memorial. I’ve always thought of the Magna Carta and the Declaration of Arbroath as the two ancient documents fundamental to modern democracy. It’s a little bit ironic reading through your post Mike just how much history has a way of repeating itself.. what goes around comes around unfortunately! 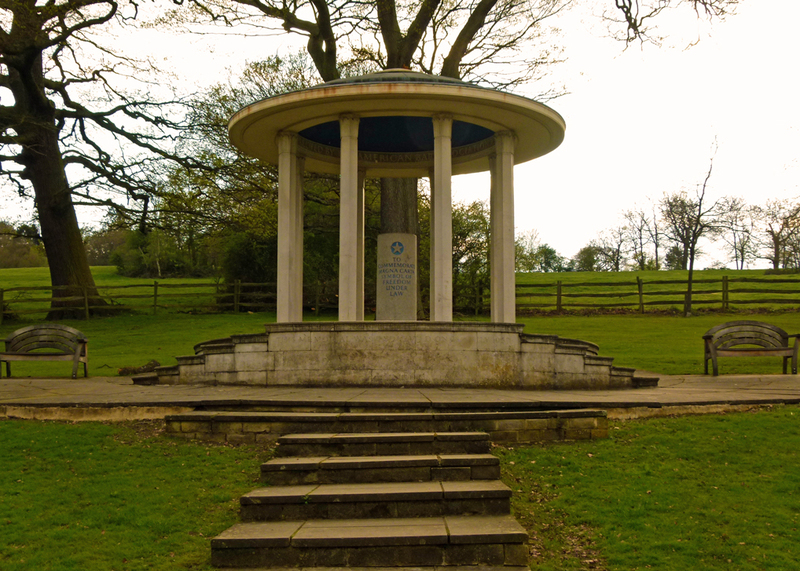 Runnymede is such a peaceful place; it is strange to think that it witnessed the Magna Carta discussions. I find it amusing that we never bothered with a memorial. I don’t believe that we really need a physical structure to commemorate the agreement; the memorial is in our legal system and Bill of Rights. I really enjoyed reading this and the way you put this event into perspective. I enjoyed your post Mike. The Magna Carta arrives at St Albans Cathedral where the famous document will be on public display to mark the 800th anniversary of St Albans’ unique heritage as a Magna Carta Charter Town. Just last week we visited Worcester Cathedral and saw the tomb of King John. I still need to do that. Hi Mike – Magna Carta means more to the Americans than it does to us here – though obviously we’ve benefited from its introduction – and need to thank the barons. You note that the document mainly dealt with local matters of the time – I guess the law does that – it can’t predict forward 800 years or even a hundred. I did go and see the British Library exhibition that was on in 2015 … recently the booklets and information I collected at that time came to light. Your explanation here is very thorough and I’ll need to remember to come back when I get to read my bumph … I really should know more. It seems that the tyrannical reign of King John was more influential than many may think – as, as you mention the fundamental principles of Magna Carta remain in law today, and are adhered to in many parts of the world. Such a pretty spot. And there’s that story of the peaches again! It must have been dysentery that did him in; but I love this subject. I’m glad to hear we own a copy of it. I probably knew that but forgot. Funny that the Pope was against it. Maybe he could see that it was revolutionary, even though the locals weren’t rejoicing over it the next morning, as you said. 🙂 Also funny that the Bar Association were the ones to officially do something to recognize the place! A very interesting post, Mike – thanks! One of the four remaining original Magna Carta documents from Runneymede is housed at Lincoln Castle, on permanent loan from the cathedral here. Needless to say, there were plenty of celebrations in Lincoln in 2015 and I know there were plenty at Runneymede. Runneymede itself is somewhere I’ve yet to visit. I find it a fitting memorial. The Durham Cathedral copy of the Magna Carta was on display here during that year- it was interesting to see the document with my own eyes.